WHAT would happen if every animal was removed from agriculture tomorrow and the world suddenly moved to a plant-only diet? Could we produce enough food to meet the nutritional requirements of the global population, and, would the shift result in fewer greenhouse gas emissions compared to conventional plant and animal agriculture? When US policy makers published new dietary guidelines in 2015 recommending Americans move to plant-based diets for health and sustainability reasons, a group of researchers from Virginia Tech decided to put the above questions to the test. Animal scientist Doug Liebe said wherever the team looked around the world policy makers were driving the message that plant-based diets equal sustainability, while livestock pollute the air and water, erode the land and cause deforestation, are inefficient and compete with people for food and water. While people in animal agriculture saw livestock as “nature’s recyclers” – producing high quality human edible proteins from human inedible fibres – others saw them as “a wasteful extravagance”, degrading natural resources and producing unhealthy foods. A common criticism was that animals consume grains people could consume on their own. 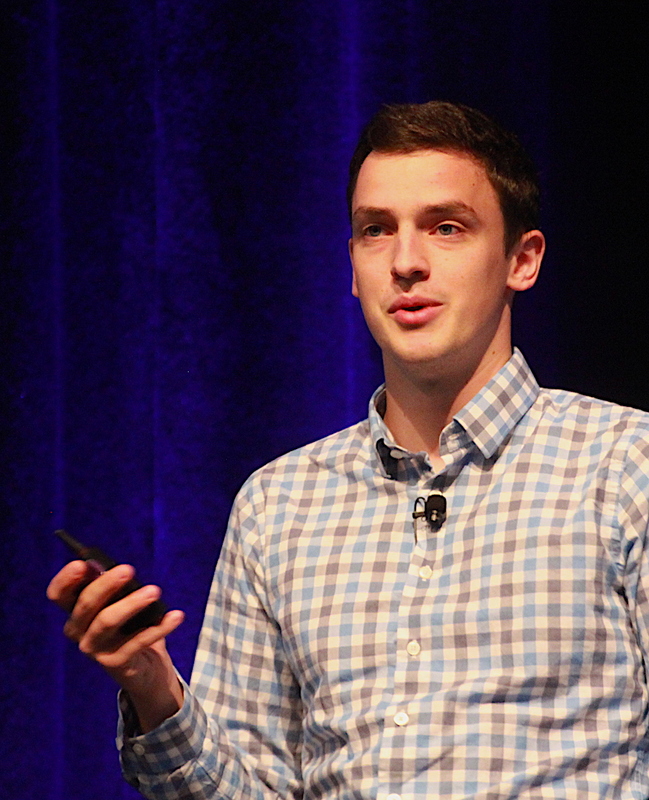 Mr Liebe told Australian Lot Feeders’ Association’s BeefEx conference this week the Virginia Tech research team wanted to look at whether plant-based diets really were the best way toward sustainability and if that could be proved with numbers. “So this was our primary motivation,” he told the conference. The research involved identifying the precise nutritional requirements of the US population and the total nutrient composition of all current US food production. The researchers then calculated the nutritional composition of US food production under a scenario of animals being removed from agriculture. This was based all cropping land being repurposed to grow food for human consumption, and accounting for the commercial synthesisation of fertiliser to replace fertiliser no longer produced by animals. The research demonstrated the US could produce about 23 percent more food if all animals were removed from its agricultural system, with most of the additional food comprising grain and legumes such as soy previously grown for animals. Removing animals would remove some greenhouse gas emissions from agriculture’s output, but much of what is removed would be countered by the need to produce more synthetic fertiliser to replace lost animal-produced fertiliser. The grain produced would now be counted as a human product instead of an animal product. The net result of removing animals from agriculture would in fact be a total decrease in US national greenhouse gas emissions of only 2.6 percent. “So at the furthest extreme if we removed all animals from the system we would decrease greenhouse gas emissions by 2.6pc,” Mr Liebe said. “That is not enough for me to stop eating beef and dairy every single day. 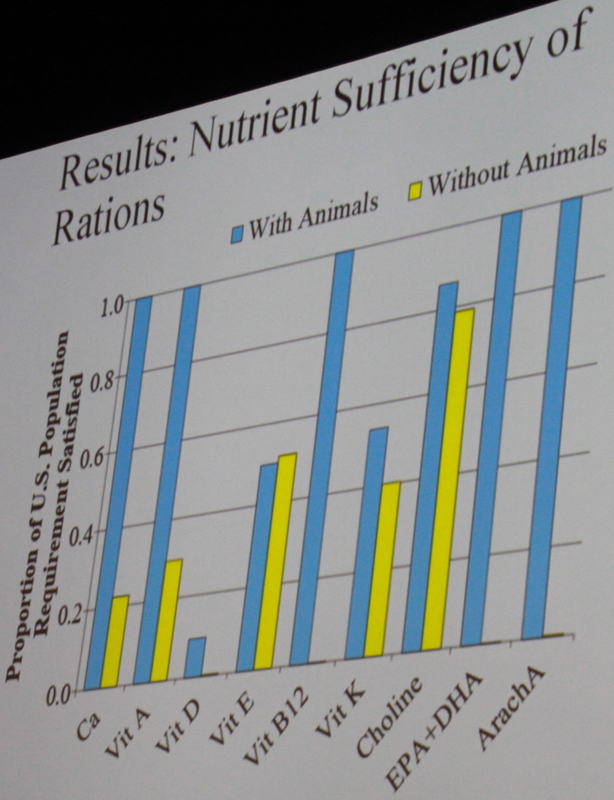 Producing more food did not equate to producing enough required nutrients. “What we really need to be focusing on are the nutrients that are in the least supply right now,” Mr Liebe explained. “The value of animals that we discovered doing this research is that the animals are a great source of required nutrients that we don’t have a good analogue for in plants. 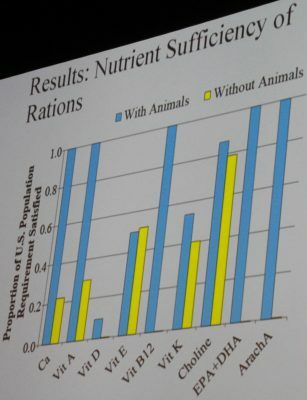 Mr Liebe said it was possible to produce protein from plants in similar proportions as protein produced from animals, but there were 11 essential nutrients produced by animals that could not be produced by plants. Mr Liebe said a current vegan diet could meet an individual’s nutritional requirements, but it was imposible to scale over the entire US population. “The important caveat is that our research was trying to scale over the entire US in order to feed the entire US population,” he said. “A current vegan diet does meet your nutrient requirements, I am not saying it doesn’t, but it is impossible to scale over the entire US population right now in the current way that we grow crops. Mr Liebe said removing animals from agriculture and meeting everyone’s nutritional requirement would mean people would have to eat 85 percent grain in their diets, mostly in the form of corn and soy flour. “That is dry matter intake of about 1.2kg per person, so that is about three to almost 3 to four times as much dry matter per day (as our current diets). “So if we have no animals in our system and we wanted to eat a completely animal free diet we would be eating all day long, we would just be constantly consuming food to try to meet that requirement. “And that is not even to mention the fact that a diet almost this high in concentrate would be almost impossible to eat in general because it would be so dry and have almost no palatability at all. Mr Liebe said the researchers realised that meeting most people’s nutrient requirements would actually require consuming more animals. Increasing the proportion of fruit and vegetables grown would increase production of some nutrients but, as it was more carbon intensive, the trade-off would be increased greenhouse gas emissions. “Growing more fruit and vegetables would meet more nutrient requirements but at the cost of increasing our greenhouse gas emissions,” he said. Interesting research, is it possible to publish a link to the full research article please? Cheers Justin – here is a link to the report – also now published on the bottom of the original article. It was so refreshing to hear the real science behind the implications of a plant based diet. The Beef industry needs to get this message promoted rigorously, particularly in light of the IPCC report released last week. Interested to see the numbers behind the claim that removing animals altogether reduces GHG emissions by 2.6%. Australia’s National GHG Inventory estimates 13.1% of our emissions are from agriculture and 72.6% of that is enteric fermentation by ruminants cattle, sheep and goats. Red meat in Australia contributes over 60MTCO2-e yr-1 which is approximately 1/3 of our Paris target of a reduction of 191MtCO2-e.